The already lengthy list of lessons learned from Baltimore continues to grow. 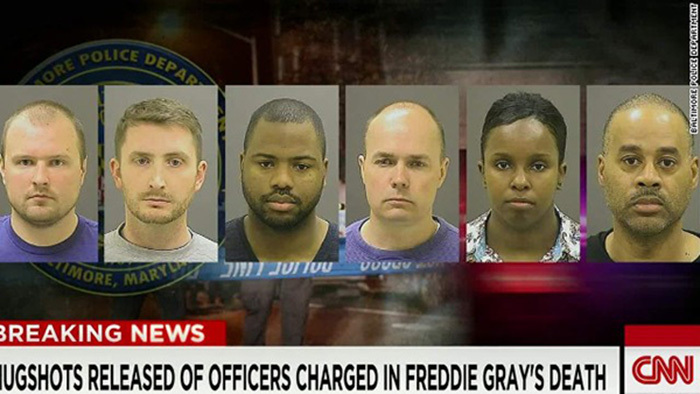 The line up of diverse Police Officers now under charges* in Baltimore can lead to one more standout observation. Diversity doesn’t change organizational culture. In stark contrast to Ferguson, MO’s police force, Baltimore’s has all of the human cultural “diversity” many would contend is necessary to generate positive change in an organization or community. Baltimore’s municipal workers seem to likewise reflect that diversity. And yet, despite the “diversity” achievements in municipal and police leadership, the headlines still cry out for “a turning point in police culture” — and “diversity” isn’t one of the changes on the public’s culture change wishlist. A trenchant culture of violent police behavior across the U.S. has been a primary theme in the media, and the primary accusation of minority citizens. Exacerbating that perception is a widely alleged “blue wall of silence,” also “blue code” and “blue shield,” terms used to denote an unwritten rule among police officers not to report on a colleague’s errors, misconducts, or crimes. Police leadership openly debunks as myth the existence of such a code. Still, the persistent public perception of its existence is fanned as details of recent incidents unfold. Unfortunately, media interviews are revealing that biased brutality does and likely will remain among the most prominent perceptions and expectations of police culture for the foreseeable future. The hopes that injecting diversity into organizations generates or facilitates positive culture change is a long held and popular notion. Diversity professionals continue to promote the idea that introducing gender diversity into C-Suites and Boards of Directors can create a positive benefit to the organization merely by its existence. For many years, diversity consultants and managers have insisted that diversity is an important culture change tool that will increase innovation, creativity and promote social cohesion. The images and messages pouring out of Baltimore convey the existence of apparent diversity, and a most obvious existence of inclusion, with Mayor, State’s Attorney, Police Chief and City Council President being black, as is 48 percent of the police force. But what is also clearly seen is that diversity appears to have been assimilated and acculturated into the existing police “Blue Culture” rather than moderating the culture to address core cultural issues directly related to diversity. The demographics are very different from Ferguson, but the psychographics aren’t. With fully half of the officers charged being African American, Freddie Gray’s death verges on being Black on Black crime. As you listen to the interviews of Baltimore’s leadership, you’ll hear a variety of important terms other than “diversity” or “inclusion” used to describe the most desired and desirable qualities for a new police culture. Instead, the most frequently used term among solutions-oriented interviewees in Baltimore news interviews and dialogues has been “impartiality.” Listen carefully for it. The underlying message is that impartiality toward color, class and culture in policing, political, social and economic policy and practice is a critical key. Recall what President Obama said recently about the another critical government service. Lesson learned: Diversity in the police workforce, it appears, hasn’t yet changed Baltimore’s police culture in the eyes of the Baltimore citizenry, at least not in the dominant perception being highlighted in the media and loudly demanded by protesters. Many among them argue that though the department color changed, the culture has not. The broader U.S. hue and cry has been for “diversity & inclusion” — but is minority America suddenly realizing after decades it’s been asking for the wrong thing…again? There is good reason to take a hard look at this particular controversial and highly visible episode in the history of policing in the U.S., and use it to separate the “diversity & inclusion” issues more clearly, including a deeper look at what’s missing. Baltimore can also be instructive for organizational leaders who struggle with their efforts to apply “diversity” to culture change issues in their businesses and institutions, but are finding low to no impact on culture. That stands as well for municipal leaders who have talked about diversity for decades, but see little or no change in the overall climate and conditions among their diverse communities. A bit embarrassed by it, perhaps, diverse Baltimore, in full tilt damage control, is now looking for another way other than a differences-based diversity mentality. Diversity & Inclusion and its impact on organizational culture today may not bear the promise of positive organizational culture change that many had believed and asserted, if it ever did. There is a different way. The missing link is peeking through in Baltimore. Should we ask whether policing could and should be carried out in an impartial CultureNeutral® way? Where else other than the IRS, and in what other endeavors could cultural neutrality play a major role in shifting organizational cultures toward an attitude of impartial behaviors? Don’t wait for your turn as a reactionary deer caught in the media headlights. Keep an open mind. Find out more about exactly what that means. *Guilt of those charged has not been established. This post is not intended to presume or imply guilt of any or all of the officers charged. **As of May 4th, CNN reported seven black homicides in Baltimore at the hands of other Blacks since Freddie Gray’s death. Did these lives matter? Is there an impartial, fair and balanced perspective on Black lives among Baltimore’s Blacks? Ready to look beyond “D&I” to power your organization’s culture change? Learn more about why the differences-based approach to intercultural issues is outdated.